Alana Stevenson, cat behaviorist, explains hissing behavior in cats. I wanted to write about something that is not frequently addressed. Hissing in cats is a commonly misinterpreted behavior. Contrary to popular belief, hissing is not an aggressive behavior, nor is it generally exhibited by an aggressive cat. Hissing is a defensive gesture. It is almost always exhibited by a cat who feels victimized, antagonized or threatened in some way. Often, it is a way to avoid a physical confrontation. In cat-cat dynamics and inter-cat aggression, the cat who hisses regularly is almost always the victim cat or the one to be chased or antagonized. (I will get to the ‘grumpy’ hissers a bit later on). Hissing is simply an emotional expression of discomfort, fear, or stress. A hissing kitty feels threatened, insecure, and uncomfortable. For many of the inter-cat aggression cases I consult on, the victim cat is usually considered the problem, or ‘aggressive,’ by the owner. This also occurs when the kitty is hissing at the dog or a family member. The common misconception is that the kitty who hisses is “teasing” or “taunting” the other cat, dog, or person. When clients look through this faulty lens, almost any and all behavior modification they have implemented have made the behaviors much worse. Especially with cat-cat dynamics, the kitty being hissed at is almost always the perceived threat, the antagonist or the aggressor. Prolonged direct staring, following, stalking, taking over areas the other cat may have previously used or claimed, and chasing, are all common behaviors exhibited by aggressive cats. Hissing is simply an expression of emotion; “I’m upset,” “I feel threatened,” “I’m uncomfortable,” or “I’m scared.” Whether your kitty is hissing at veterinary staff (and unfortunately labeled as the ‘mean’ kitty) or whether your kitty is hissing at a newcomer to the household, your kitty is feeling vulnerable, threatened, or insecure. If you try to “correct” or punish the hiss, you will only make a bad or scary situation worse, and make your kitty more upset. Occasionally, there are kitties who hiss to express that they dislike something (when no threat is present). These kitties will often hiss but will not direct their hissing to any particular individual. A human equivalent might be swearing when you forget or drop your car keys. These kitties are rather comical. They may hiss to express disgust or disappointment. 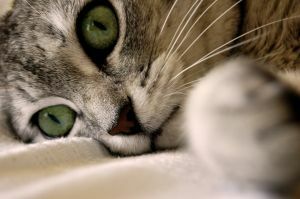 An example would be when your kitty, wanting to enter a room, hisses after you gently try to maneuver him or her away. Or, when your kitty is outside in the yard or on the porch, when you bring your kitty in, s/he walks away and hisses in protest. (Note: Some cats also hiss when they experience pain. For instance, a kitty with arthritis may hiss after jumping down from a perch or off a chair). Obviously, there are many things a cat may be upset by or dislike. By being aware that your kitty who hisses is feeling afraid, threatened, or uncomfortable, it may change or modify the way you interpret your cat’s behavior or inter-feline dynamics. How do I get he cat to stop hissing at my son?. Obviously, remove the problem individual and comfort the kitty. Does your son have an allergy and blows his nose a lot in front of the cat? Well that sounds like HISSING to your cat. He thinks your son is being aggressive..Try to have your son slowly blink his eyes at kitty. That’s the universal kitty peace sign. @ Stormkite, are you suggesting that I get rid of my son and comfort the cat?…Tell me you’re not suggesting that. If you are then you can have the cat, because I will NEVER choose the cat over my child. They are likely suggesting just that. However, the suggestion is meant to be inflammatory. This is a minor example of “Trolling”. Welcome to the internet. Asiya – it’s going to be okay. Believe it or not, someone saying something doesn’t make it true. Stormkite does not have the ability to say you should get rid of your son and have it happen. However, Stormkite obviously has the ability to mess with your emotions. Why would you give someone that power? It was a JOKE. As for the other person who replied, I’m not sure why their first thought and expression towards advice would be to assume Stormkite is a troll, rather than just a joker, but I suppose some people just find it necessary to assume the worst and create drama where there is none. I find it rather scary that you are getting so bent out of shape by a simple (and highly obvious) sarcastic/joke comment and I recommend that you stop taking life – and yourself – so seriously. I have a feeling that you tend to jump to massive conclusions and in turn, voluntarily read in to things to try to find drama and angst. Give it up. You can step off your soapbox. Nobody was seriously suggesting you give up your son. It’ll be okay, I promise. People are way too serious. My cat hisses at everything a few times a day in evening time how do I stop it. Don’t push your own agenda on your furry friend. Quit interacting when shes mad and be lovey when she feels like it.I have a kitty that is like this but the patient route is worth it. My son and wife have serious allergies. However, my son is always blowing his nose loudly in front of the cat. It sounds like HE is hissing at kitty and she is taking it the wrong way. This has been many years now and she still remembers and will also attack his feet when his back is turned. He is the only one that feeds her but she still must go after him after he puts the bowl down. She hisses at me and mom when we make her come in the house as she is having fun and we are spoiling it for her. I’m thinking hje used to tease her when she was young by hissing back at her out of his mischeviosness. The nose blowing just makes it worse. Sometimes she lets him pet her with no problems. It’s baffling. Mom also blows nose loudly near the cat but no reaction. Maybe she can detect that son secretly doesn’t really like her that much and wishes we bought a dog but he denies this. In the beginning he did say he woulld have liked a dog but I bought in this urban stray Calico back in 2004. She is 10 now and is a family member. The son is now 31 years old. I would not part with either one. I love them both. She kills mice and moths and he helps around the house. They both make mom and I feel comfortable having them around for the rest of their lives. Normally very loving , always near me when I’m in the house, follows me room to room and sits with me all the time and even places his paw on my hand when near me. Recently began to hiss at me for apparently no reason. The first time when I had a flea repellant spray in my hand, the second time I know I had the scent on me of that chemical cause I had just gotten done using it on another cat. Was handling that same chemical, and used a flea comb on him with that chemical on it with no reaction. The next couple of times while in process of feeding them last time giving the three their nightly treats. After a while he was back to his normal like self being cuddly and loving, picking him up, held him got the usual loud purr but no idea why he hissed at me. Doesn’t seem to be in any pain, and the last few times there was no presence of the flea chemical that seemed to have triggered at least one of the hissing events…. What are your thoughts. Well cats use hissing as a pseudo aggressive scare tactic. They think that’s how you react to a plausible threat hoping o scare the threat away. I tried it on a dog that was trying to sneak up on me from behind and it works. It really freaked the dog out. He didn’t know what to think with this human hissing at him like a cat, He finally gave up and ran away after some feigned barking. I’m thinking that your fleas spray uses compressed gas to propel the flea spray? Coupled with the unpleasant chemical odor, the sound coming from it probably sounds like HISSING to him. I would just get him a flea collar. The best is the drops behind the neck. Also comb out the fleas with a flea comb and dip the comb in Dawn dish washing liquid. It will drown the fleas.